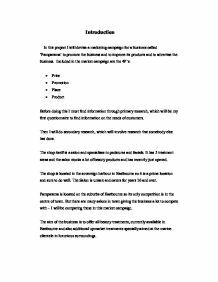 Introduction In this project I will devise a marketing campaign for a business called 'Pamparama' to promote the business and to improve its products and to advertise the business. Included in the market campaign are the 4P's: * Price * Promotion * Place * Product Before doing this I must find information through primary research, which will be my first questionnaire to find information on the needs of customers. Then I will do secondary research, which will involve research that somebody else has done. The shop itself is a salon and specialises in pedicures and facials. It has 5 treatment areas and the salon stocks a lot of beauty products and has recently just opened. The shop is located in the sovereign harbour in Eastbourne so it is a prime location and sure to do well. The Salon is unisex and caters for years 16 and over. Pamparama is located on the suburbs of Eastbourne so its only competition is in the centre of town. But there are many salons in town giving the business a lot to compete with - I will be comparing these in this market campaign. The aim of the business is to offer all beauty treatments, currently available in Eastbourne and also additional upmarket treatments specially aimed at the marine clientele in luxurious surroundings. Primary Research What is primary research? Primary research is also known as 'field research' or 'market research'. It is usually marketing research specially commissioned and undertaken for a specific purpose. Price Check All prices seem to be the same as the beauty salon in Eastbourne Town (Body & Soul) and I noticed in the Price List Pamparama offers more treatments but some things do appear more expensive. I think this needed due to the high demand in pay for rent in the Sovereign Harbour because it is a prime location because not only do you get the customers living in the Harbour but you get people from all around the world come in on their boats. ...read more. Overall the general public said that the location was excellent apart from the few minor bad points such as the settlement being in the corner. Secondary Research I have researched many advertising companies that the Yellow Pages provide and I have found out that Pamparama have already advertised on yell.com: Pamparama Unit 18, The Waterfront, Sovereign Way, Eastbourne, East Sussex BN23 5UZ Tel: 01323 471242 Classification: Beauty Salons Other Advertisement methods Eastbourne has a lot of local and county advertising magazines and newspapers to advertise in. There is paper that is delivered to your door in the harbour called 'Trade Catcher', which is for Eastbourne and Surrounding Area. The magazine is delivered free of charge 4500 homes and businesses in Polegate, Willingdon, Alfriston, Sovereign Harbour...etc. Their prices vary per ad size but are very cheap. The prices are below: Prices for advertising per month �15 1/8 Page Ad �25 1/4 Page Ad 1/4 Page Ad �35 1/2 Page Ad �50 A5 Page Ad The Friday - Ad is more well known than the Trade Catcher. It advertises all over the UK and in each area has its own Friday-Ad. It is also free and not only has advertising by the magazine but has a very professional website which you can also advertise your business or private ads. This is the rate for an ad for the Eastbourne area: Eastbourne Edition General Price Per Word (private): �0.32 Price Per Word (trade): �0.45 Situations Vacant Price Per Word (trade): �0.70 They also sometimes do deals such as quarter page ad for �5 and two for one, but you've got to be quick to get them! If the ad is small it will generally not be seen. Friday-Ad quoted that you get 8x more response if your ad contains a photo and the logo of Pamparama is fairly loud and sticks out. I will devise an ad on www.friday.co.uk containing the contact details and a picture to see what the price is. ...read more. Product Most people in the questionnaire thought that the products on offer were overpriced 21-9 but even though these are said to be overpriced the treatments and services on offer were proven modern and are popular due to them being of a new release last year. Because Pamparama is a fairly new Salon, it offers the latest in treatments and machinery such as sun beds and tanning machines. Pamparama offers the latest 'SOTHYS Professional Facial Products' and 'OPI - the best in nail care products'. These expensive products are offered and well as beauty treatments currently available in Eastbourne because it has to cater for the richer half of the marina and for the upper class that come in the harbour via boat to visit the marina itself. Pamparama offers these products and services - Spa body treatments - Hand and foot treatments - Facials - Body treatments - Nails - Make-up - Depilation - Epilation - Eye treatments - Back treatments - Semi-permanent make-up - Tanning. The staffs are devised as partners - a working owner, one full time manager who is a key member of staff, with nine years previous experience in the industry. There are also four other staff who work part-time, these staff will not change any profit because this is on a pro-rata basis. The machinery currently in the salon does not produce much noise at all and releases no pollution which is a big attraction to customers. Suppliers Capitol, House of Furmuir and Beauty Express are some of the suppliers for Pamparama but there a vast amount of suppliers all looking for Pamparama and therefore the discounts that they offer new businesses are huge, with this they decided to initially order every item and product required in one order, thus achieving maximum discount. Key Factor for potential Pamparama offers semi permanent make-up which is not on offer any where else in Eastbourne and is a very popular product. Source Reference * www.yell.com * www.upmystreet.com * http://www.tingleycommercial.co.uk/shops/shops_eb.htm * www.fridayad.co.uk * www.tradecatcher.co.uk ...read more. Gallo Rice in Argentina Gallo Rice began in Argentina in 1905 through a subsidiary called Arrocera Argentina (who would eventually lead them to Poland). The early 1990's were the beginning of an attempt by the Argentine government to turn around an inflation-ridden economy and bring the country out of its latest recession. Firstly, the use of short, incomplete sentences is evident in the final sentences of the text at the bottom of the advertisement: The Fiat Multipla. The ultimate family car. Driven by passion. The use of short, incomplete sentences makes the text easier to read and may be an attempt to imitate spoken language. Views on Viral as a medium Mr. Carvalho agreed that Viral is very effective these days. They create impact since they are usually their funny or thought provoking and generate word-of-mouth (word-of-email with all the forwards it generates). The user is the one pushing the message and not the brand. On the final side, I used the image of the close up of her eye and nose teamed with a statement saying they will get a free make over by an expert make up artist and free entry into a prize draw for a goodie bag of products.